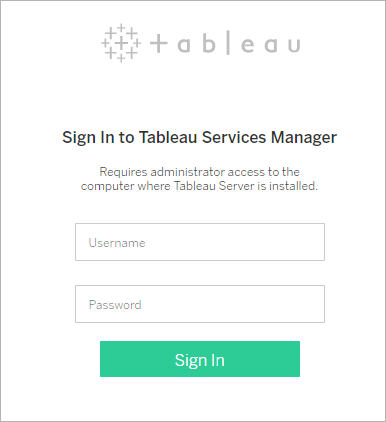 This topic explains how to sign in to the Tableau Services Manager (TSM) web UI. The TSM web pages are used to configure Tableau Server settings such as user authentication, server processes, caching, and other server-related settings. You can also configure TSM from a command line shell. See tsm Command Line Reference. The TSM web UI is not the same as the Tableau Server admin pages. Log on to the Tableau Server admin pages to create and edit sites, users, projects and other content-related tasks. See Sign in to the Tableau Server Admin Area. If you are running Tableau Desktop and want to sign in to Tableau Server to publish or access content and data sources, see Sign in to Tableau Server in Desktop. The account that you use to sign in to TSM must have administrative access to the local computer where Tableau Server is installed. Tableau Server on Linux relies on PAM for core authentication scenarios. For more information about PAM integration for TSM administration, see TSM Authentication. If you are running a distributed deployment of Tableau Server, then enter the host name, or IP address of the computer running the initial node. The credentials you enter must have administrative access to the computer running the initial node, as specified above. Specify an HTTPS protocol in the server URL. Tableau Server installs a self-signed certificate as part of the installation process. Therefore, the protocol must be specified as https. For more information about the self-signed certificate and certificate trust for TSM connections, see Connecting TSM clients. Specify the default port for TSM web UI (8850) in the URL. You must specify the hostname or IP address of the computer running TSM. If you have set up a load balancing or proxy solution in front of Tableau Sever, do not specify the load balancer or proxy address. Open a browser and enter the Tableau Server URL, and append the dedicated TSM web UI port. In the sign-in page that appears, enter your administrator user name and password. Note: Tableau Server creates and configures a self-signed certificate during the installation process. This certificate is used to encrypt traffic to the TSM Web UI. Because it's a self-signed certificate, your browser will not trust it by default. Therefore, your browser will display a warning about the trustworthiness of the certificate before allowing you to connect.